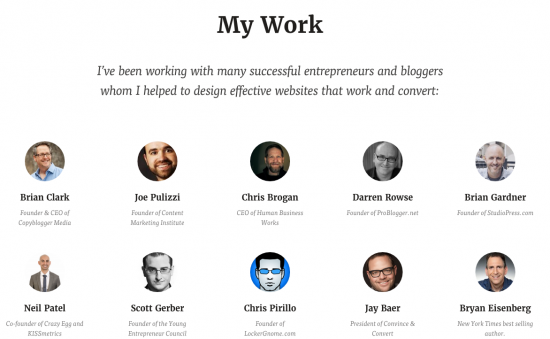 A professional website can be a freelancer’s secret weapon. You can craft it into a platform that delivers professional, well-qualified prospects—the type of people you dream of working with when you’re just starting out—straight to your email inbox. No more chasing down clients on job boards. You don’t have to spend the time and energy doing that when you have an inbound marketing system that attracts the right kinds of prospects and screens out the rest. But let’s face it: many freelancers (if they even have websites at all) just aren’t using them to bring in clients effectively. The good news is this problem isn’t a permanent one. Most freelancers can get better results if they’re willing to change the way they approach their websites. Most freelancers grasp the importance of having a website, but they come up short when it’s time to execute. 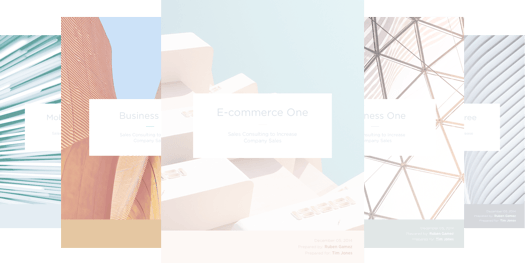 If you take a look at the free website proposal template bundle we give away, you’ll see how even when selling a website, you need to focus on the results (like more leads or clients). A website isn’t a one-size-fits-all tool. It can do different things for different types of businesses. You can tailor it to serve your specific needs. Not a whole lot. They might enjoy some success here and there, but reality doesn’t live up to the spectacular results they had in mind. The results usually don’t justify the time, money, and effort it takes to maintain the website. I think a big reason freelancers go wrong is by adopting their business website “philosophy” from the large corporations’ playbook. It’s understandable why freelancers would see what giant companies are doing and want to emulate them. These websites are common; we see them all the time. And after all, they must be doing something right if they’re in the Fortune 500! But multinational corporations are worried about expanding their international market share and appeasing cranky shareholders. You’re worried about nailing down a handful of top-notch clients. The goals for your businesses are dramatically different. Using your website to attract more (and better) clients starts with recognizing this. And once you do, you can change your approach to get the results you’re looking for. Freelancers miss out on opportunities because they aren’t using their websites effectively. But their mistakes boil down into common patterns. Let’s take a second to see how you’re using your website now. That way you find out how to sharpen your approach and nail down more clients. What happens when someone lands on your website, but they aren’t ready to hire you yet? Big businesses have spent decades building up name recognition and brand loyalty. No one’s going to “forget about” Coca-Cola. If you want to visit Coke’s website 6 months from now but can’t remember the URL, you can just type it into Google. But what about you? Even if you’re an established freelancer, you can’t expect people to remember your name when they’re ready to hire someone next year. Most freelancers don’t have a way to guide prospects through the intermediate steps between finding your website and hiring you. There could be many of those, especially if your services are expensive, technically complex, or hard to explain. Not accounting for them limits your ability to attract anyone besides the most desperate and impulsive clients. Great freelancer websites take advantage of the opportunity to collect and nurture leads. Someone might not be ready to hire you yet, but you can stay on their radar and proactively move them closer until they are. Email marketing is a great way to capture leads and move them along the buying process. You can sign up to an email service like Drip to do this. Both are affordable, easy to integrate into your website, and make keeping track of leads simple. He makes it simple for people to sign up to his list and find out what they’ll get out of it. Once someone signs up to your list, you can update them whenever you put out fresh content. You can also send them exclusive content (like an email newsletter) to educate them about your services, help them solve problems, and build your credibility. Autoresponders can help you drip out emails automatically. 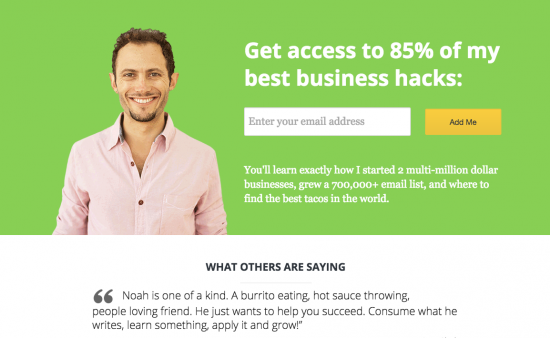 Something else to think about: what would drive someone to sign up to your email list? Your prospective clients won’t do that out of the generosity of their hearts. If all you’re offering people is “free updates” in exchange for handing over their personal information, you’re making things hard on yourself. What’s one topic your prospective clients want in find out more about? What’s one problem you can solve? Packaging up that information—it could be a report, guide, video course, or something else—and giving it away is a smart way to give visitors the incentive they need to sign up to your list. Most people won’t be ready to hire you when they visit your website the first time. But that’s fine if you set up a way to move them closer to that final transaction. Put a system in place, and you free up time to deliver top quality work to your current clients and grow your business. First impressions can make or break you… especially online. Visitors will only give you their attention for a few seconds. If they can’t find what they’re looking for, it won’t take long for them to hit the “back” button on their browsers and find one of your competitors. This is troubling for a lot of freelancers who do top-quality work but get overlooked for their competitors. Visitors won’t make an effort to sift through complicated navigation menus or multiple web pages to find out what you can do for them. That’s why it’s crucial for you to make things as easy as you can for them. A great freelance website translates your skills into valuable, tangible benefits for your visitors. It doesn’t leave any doubt as to what you can do for prospective clients. This can be a challenge, especially if you offer a variety of services or they’re complicated or technical. But do the best you can to distill your services to their most basic, useful elements. Calling yourself a “freelance writer” doesn’t mean much to potential clients. They want to know how that could be useful to them. So you could reframe what you do to something like “writing premium articles that engage readers and boost your search rankings.” This makes the benefits for the client immediate and clear. Check out this article about Derek Halpern’s “header removal test.” It brings up a good benchmark to strive for: your visitor should be able to figure out exactly how you can help them… even if your website header went missing. 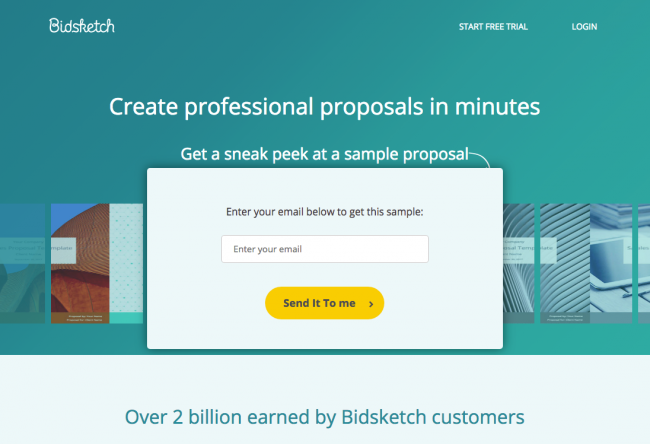 The website makes it clear exactly how it can help customer: create proposals in minutes instead of hours. People could figure it out even if the header was missing, thanks to the large headline just below logo and login menu. This step works well in combination with lead capturing. Say a visitor finds your site. They figure out what you can do for them instantly. Then, if they’re interested but not yet ready to hire you, they can enter their info and hop on to your mailing list. Your website is like a living, breathing C.V. that everyone gets to look at. It can be one of your greatest marketing tools, or a gigantic red flag that causes would-be clients to jump ship. Your website doesn’t have to be complicated to help turn you into a freelance star. But it needs to be professional. It’s amazing how many freelancers stumble here. They get a website up, slap on an outdated WordPress theme, and don’t get much further than that. You’re in complete control of the image you portray on your website, so it’s best to do everything you can to make it an awesome one. A clean, professional design: A lot of freelancers go overboard and clutter up their websites with content and features that overwhelm their visitors. You don’t need to do that; there’s nothing wrong with a simple website. Consider each element carefully. If something doesn’t move visitors closer to becoming your clients, scrap it. Do people really need to see your latest Tweets? A single purpose: converting visitors into clients: Of course you want your website to make you look good. But looking good doesn’t grab you clients or put money in your pockets. Remember that the sole purpose of your website is to get people to eventually hire you. There’s no time for tangents. One purpose. Keep it in mind at all times. Testimonials and social proof: testimonials from happy clients are great ways to build credibility and leverage social proof. They show visitors that you’ve delivered in the past and made people satisfied enough to endorse you in public. This makes it easier to convince them that you could do the same for them too. Useful, relevant content: Use your website to produce content your ideal clients would find valuable. Don’t make the common mistake of producing content that others in your industry would like. What would your clients want to know more about? Regular, high-quality content builds trust and establishes your authority as an expert in your niche. What keeps interested people from becoming your clients? If you can identify the most common sticking points, you can head them off proactively to convert more visitors. Cost: people are struggling to justify your price tag. You can minimize the sticker shock by reframing your services in terms of the value you can deliver to your clients. You want to leave people with the impression that the cost of your services is an investment for a greater return. Expertise: what makes you qualified to charge people money for providing these services? Here’s the place to brag (tastefully, of course) about how long you’ve been in the industry, the special skills you’ve developed, and any noteworthy clients you’ve worked with. Unique selling proposition: why should someone hire you instead of any of the other competitors out there? What separates you? What can you deliver that no one else can? References/Portfolio: prospective clients will sometimes want to see a track record of work you’ve done in the past. Is there anyone they can contact who will vouch for the quality of your services? 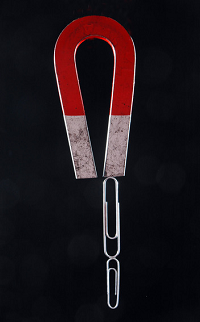 Where can visitors find samples of your past work? You can head off many of these potential objections by using client testimonials strategically. Another thing you can do is to create an FAQ page to address some of the most common questions you receive. Or you can tailor your “About” and “Services” pages to address these points. Potential objections are like friction that slows down visitors from becoming clients. The more of it you can remove, the better. You don’t have to overwhelm people with content; tailor it to bring down barriers and position yourself as the best choice. It’s time to turn your website into a platform that attracts top-quality clients like a magnet. These strategies will separate you from your competitors. Use them to present yourself as the best choice to solve people’s problems and free up time and energy to serve your current clients.